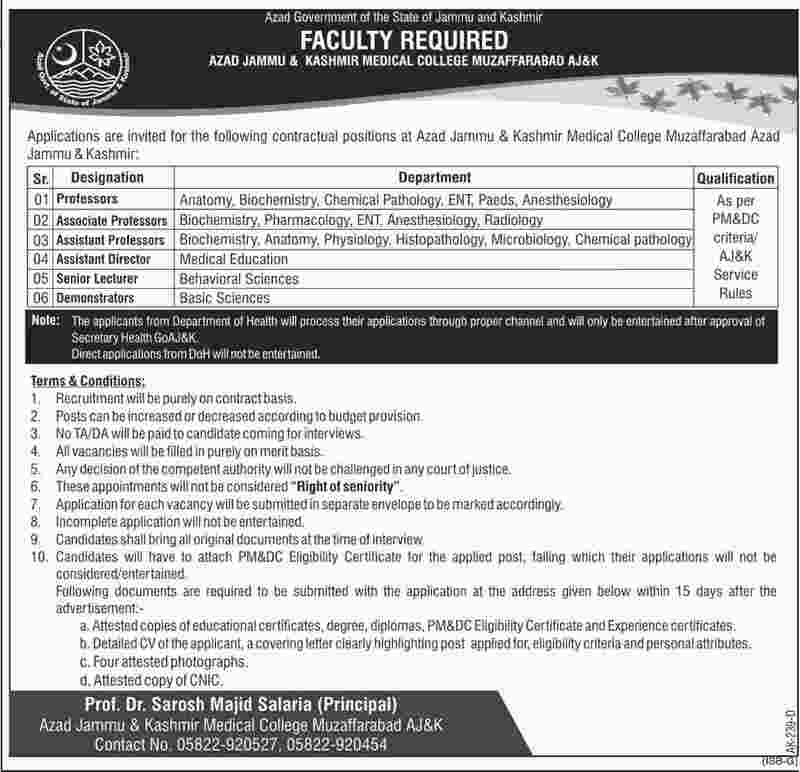 Applications are invited for the following contractual positions at Azad Jammu & Kashmir Medical College Muzaffarabad Azad Jammu & Kashmir Professors, Associate Professors, Assistant Professors, Assistant Director, Senior Lecturer, Demonstrators. If you are competent and eligible then you should apply for these jobs 2019 of azad jammu & kashmir medical college muzaffarabad ajk. Because you have a great opportunity to join the AJK medical college muzaffarabad to brighten your future, So don’t miss this opportunity. The applicants from Department of Health will process their applications through proper channel and will only be entertained after Approval of Secretary Health GoAJ&K. Direct applications from DoH will not be entertained. So you must the follow policies, terms and conditions. One more thing is that your must fill the application form carefully wring information or any mistake can be cause of rejection of your application form. Following documents are required to be submitted with the application at the address given below within 15 days after the advertisement publish date. Attested copies of educational certificates, degree, diplomas, PM&DC Eligibility Certificate and Experience certificates. Recruitment will be purely on contract basis. Posts can be increased or decreased according to budget provision. No TA/DA will be paid to candidate coming for interviews. All vacancies will be filled in purely on merit basis. Any decision of the competent authority will not be challenged in any court of justice. These appointments will not be considered “Right of seniority”. Application for each vacancy will be submitted in separate envelope to be marked accordingly. Candidates shall bring all original documents at the time of interview. Candidates will have to attach PM&DC Eligibility Certificate for the applied post, failing which their applications will not be considered/entertained. Detailed CV of the applicant, a covering letter clearly highlighting post applied for, eligibility criteria and personal attributes must be attached. You must attach Four attested photographs with front back and Attested copy of CNIC are required so you must attach too. For the Further Details about the Azad Jammu And Kashmir Medical College Jobs you can contact with us in our feedback system we will contact you back and will help.